Four of the products created for the Co-op by Freshtime UK Ltd have been shortlisted in the prestigious Quality Food Awards which take place next month. The Co-op’s Irresistible King Prawn, Mango & Coconut Noodle Salad and its Vegan Falafel and Houmous Salad are in the running for an award in the Food to Go – Salads category. Having scooped three gongs at last year’s Good Choice! 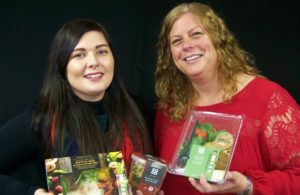 Quality Food Awards, the team at Freshtime is also hoping for another win at this year’s event, after the Co-op’s Pulled Beef and Black Bean Noodle Meal Pot was nominated in the Food to Go – Meals category. Its Cauliflower and Coconut Vegan Meal Pot is also in the running for an award in the Vegan/Plant-based Protein category. The Quality Food Awards and the Good Choice! Quality Food Awards are part of the overall Q Awards, which have been established for 38 years and are the most prestigious for food and drink products on sale in UK grocery outlets. Fiona Frossell, Commercial Director at Freshtime, said: “These awards provide a great opportunity to showcase our products and the capabilities of our talented development team to a national audience. “We continue to work hard on creating products that are healthy and convenient, and fit with growing consumer trends such as flexitarianism and veganism. Representatives from the Boston-based company will be attending the awards ceremonies at the Grosvenor House Hotel in London on 9th November.